My Life with Pipidinko: Countdown to Christmas Activities. Day 9. Building a Gingerbread House. Countdown to Christmas Activities. Day 9. Building a Gingerbread House. 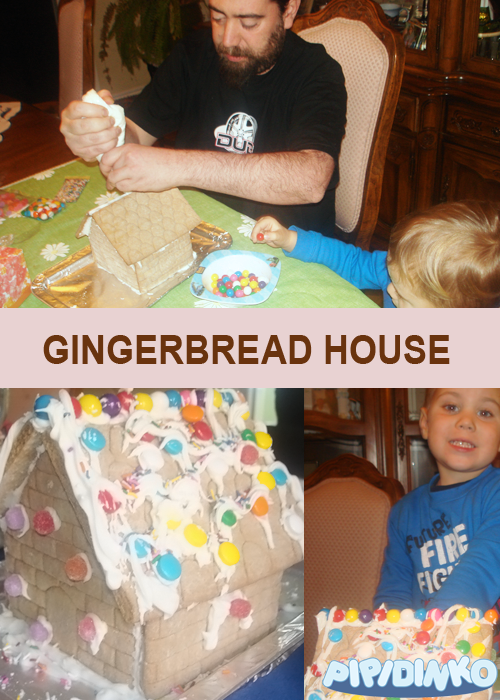 I have never built a gingerbread house before, and only saw them on pictures; but as we read Christmas books, there is always a gingerbread house featured, so I suggested to Santino we make one. He really wanted to do that! He kept talking about gingerbread house, until we went and bought it yesterday. Now that I saw what it looks like and what it entails, I might try and bake one next year myself. This year Santino and his papa did all the work, putting all the pieces together and decorating it. Santino really wanted to do everything hands on, but his coordination is not 100% yet, so in order to have the house actually standing, we had to avoid his help in this step. I did let him help me pipe the icing on the walls. He would squish the end of the piping bag, and I tried to make sure that it went straight on the edge. After the house was built, Roberto (my husband) and Santino did their best in decorating it with icing and candy and gum balls. I think it looks fantastic! What do you think? 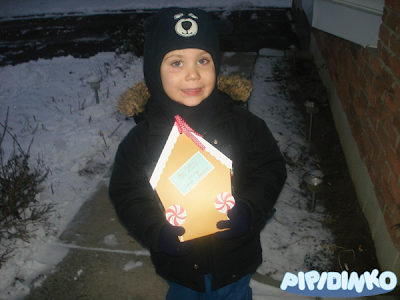 Another part of yesterday's countdown to Christmas activities, was when we delivered some cookies to our neighbors. I participated in a cookie exchange a couple of days ago and had some great variety to give. Now, that they are all gone, I'm thinking I want to bake some more.